This quickstart gets you going with Databricks: you create a cluster and a notebook, create a table from a dataset, query the table, and display the query results. You are logged into a Databricks workspace. See Try Databricks. 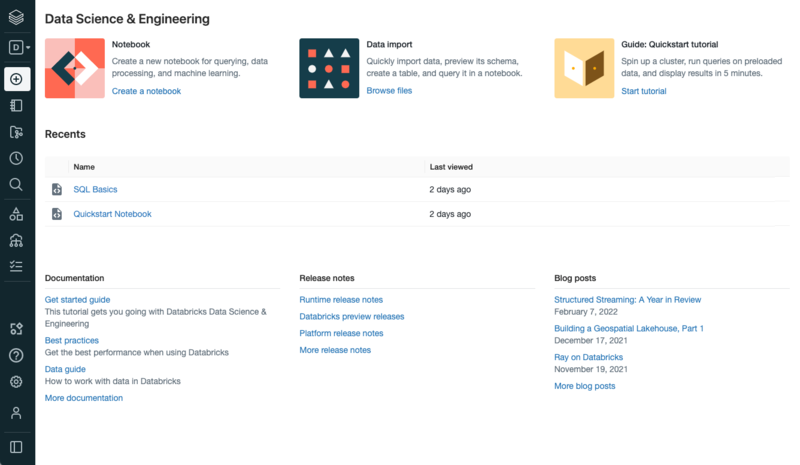 From the sidebar at the left and the Common Tasks list on the home page, you access fundamental Databricks entities: Workspace, clusters, tables, notebooks, jobs, and libraries. The Workspace is the special root folder that stores your Databricks assets, such as notebooks and libraries, and the data that you import. To get help, click the question icon at the top right-hand corner. 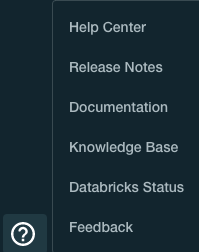 In the sidebar, click the Clusters button . On the Clusters page, click Create Cluster. 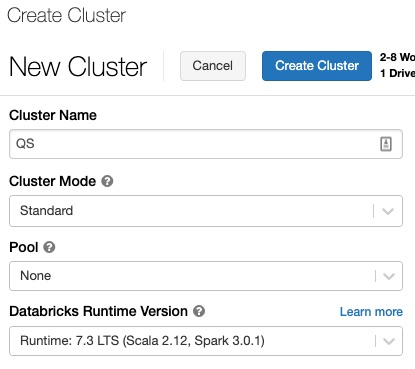 On the Create Cluster page, specify the cluster name QS and select 5.2 (Scala 2.11, Spark 2.4.0) in the Databricks Runtime Version drop-down. In the sidebar, click the Workspace button . In the Workspace folder, select Create > Notebook. 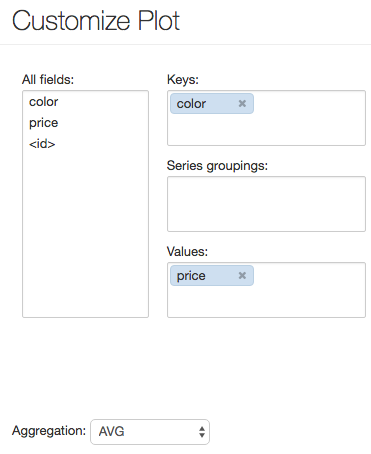 On the Create Notebook dialog, enter a name and select SQL in the Language drop-down. This selection determines the primary language of the notebook. Click Create. The notebook opens with an empty cell at the top. Create a table using data from a sample CSV data file available in Databricks Datasets, a collection of datasets mounted to Databricks File System - DBFS, a distributed file system installed on Databricks clusters. You have two options for creating the table. Databricks Delta offers a powerful transactional storage layer that enables fast reads and other benefits. Delta format consists of Parquet files plus a transaction log. Use this option to get the best performance on future operations on the table. Run cells by pressing SHIFT + ENTER. The notebook automatically attaches to the cluster you created in Step 2 and runs the command in the cell. Run a SQL statement to query the table for the average diamond price by color. To add a cell to the notebook, mouse over the cell bottom and click the icon. Copy this snippet and paste it in the cell. Press SHIFT + ENTER. The notebook displays a table of diamond color and average price. Display a chart of the average diamond price by color. Click the Bar chart icon . Drag color into the Keys box. Drag price into the Values box. In the Aggregation drop-down, select AVG. Click Apply to display the bar chart. We’ve now covered the basics of Databricks, including creating a cluster and a notebook, running SQL commands in the notebook, and displaying results. To dive into various Apache Spark topics, see Apache Spark Getting Started.